Tutima is the German watch company. The history of the brand began in 1926. At the very beginning, the company produced pocket watches, that met the highest standards of that time. The company has developed some technical improvements for the watch movement, that led the brand to the high position on the market and allowed the company to compete with the Swiss watchmakers. 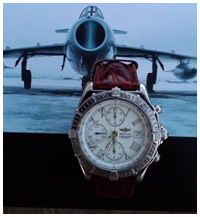 During the World War II the company manufactured chronographs for the German Air Force. They were used to calculate the time or to coordinate the routes, as well as to facilitate the synchronization of the takeoff and landing. After the war, the Soviet Union received the destroyed factory of the company in Dresden as a trophy. The survived equipment and machinery was restored. As a result of such a "plagiarism", the Soviet chronograph, known as "Kirovskii" was created, but it was nipped in the bud. The chronographs were released in the very limited edition: since 1947 till 1952 the company had produced not more than 3000 timepieces. Nowadays Tutima continues to create watches, following the best company traditions and using the hi-tech technology. In 1985 the company launched mechanical Military 798 chronograph, that had been developed specially for pilots of the Air Force. The watch was a great success all over the world. The timepieces were tested under the various extreme conditions, and honorably passed all the tests. The development of the modern Tutima Air Force chronographs arroused a great interest to the watches, belonging to the period of war. The company management decided to continue the production of the faithful replica of the famous watch. The collection includes five lines of Tutima watches. The watches have clear and austere silhouette, every detail is thoroughly worked out, the dials are clear and easy-to-read, having no superfluous elements. The watches are equipped with the Swiss movements. The watch cases are made of steel or 18K gold, sapphire crystals, crocodile leather straps, that can be optionally made of stainless steel. The water resistance of some models is about 200 m.